We all have our coping mechanisms, and it’s a good thing we do. Here in Minnesota, winter brings a boat-load of snow and this year, record below zero temperatures to boot. 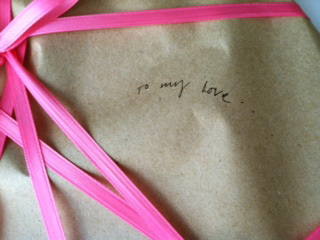 That’s why I was so delighted to see this sweet extra-curricular project my daughter fashioned. 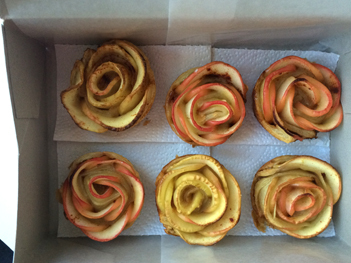 Here, in the midst of snow days and the occasional power outage, she didn’t just bake a cake. 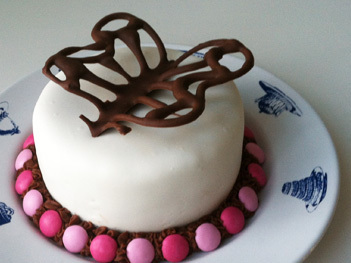 She baked a pink-and-chocolate-and-white cake with a lacy chocolate butterfly on top. The cake is tiny, only about four inches across. It’s white cake, covered in chocolate buttercream frosting, with rolled white chocolate over that. She piped a ring of frosting around the bottom into which she pressed alternating light and dark pink m&m candies. But the true genius is the butterfly. 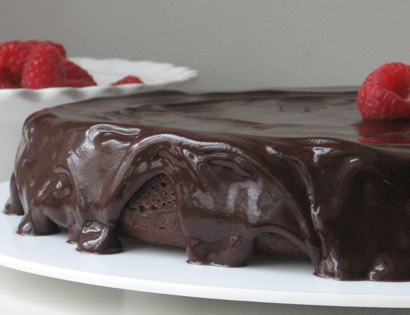 After melting the chocolate, she folded a piece of parchment paper and placed it, unfolded, onto an open book. 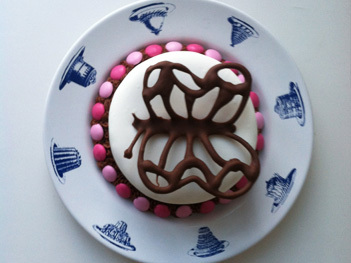 The parchment paper took the shape of the curved pages underneath, as did the chocolate, drizzled in a butterfly shape. Once cooled (in the fridge), the resulting winged creature stands 3-D atop the cake as if it just alighted temporarily before moving on to the next posy. I can’t decide which was the more gratifying winter escape: The beautiful butterfly, or gobbling it up! Yum! Sometimes a good idea in one part of your life applies perfectly to another. I was inspired by Kathy Hanson’s little “Backpocket” video about “chunking”, taking a big task and breaking it into manageable chunks. (Watch Kathy here). She was applying it to business. But I realized I have been doing just that to stay on top of keeping my house clean. I fully admit I am NOT a natural master of house cleaning. But I do something that helps me tremendously. 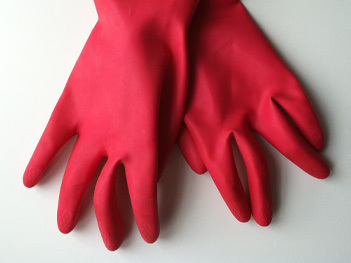 Once a week, I take 15 minutes or a half hour at the most to do one extra cleaning thing. This thing has to be the kind of thing that you normally never get around to. For example, at the back edge of our bathroom sink where it meets the tile wall there is a stripe of caught-up gunk. It just gets there over time because it is a crevice. Who knows what-all settles there, and regular sink cleaning just doesn’t reach it. So my task this week will be to take the grout brush that I bought at Target and some cleaner with bleach and scrub that line. And that’s it. If it takes less than 15 minutes (which it will, except the part where I have to remember where I put that brush) that’s OK. I’ve fulfilled my “one extra” this week. 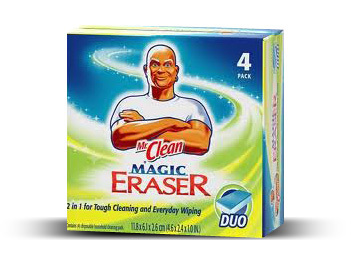 Another really cool thing you can buy for your One Extra are these “Magic Erasers”. If you haven’t tried these you HAVE to get some. Just DO NOT let your little kids use them as they are deceptively strong and can hurt tender baby skin. They clean walls and things like white woodwork and cupboard surfaces. And they are addicting, I’m not kidding. 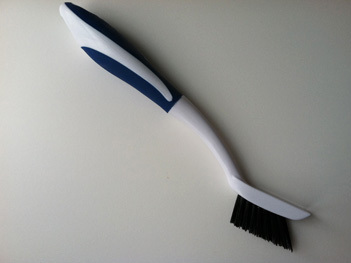 Get some, and clean the dirty areas around the light switches of just one room for your One Extra. (BTW I’m not organized enough to be plugging this product for compensation. This is a complete freebie). You will be amazed at how these little One Extras add up. Last week I took the grout brush to the shower tiles. The week before, I just cleaned the greasy layer form the pot rack. 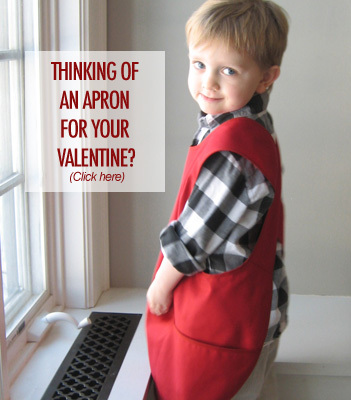 I might even clean a window sometime–one window will suffice for my One Extra. We don’t want to go overboard. I first thought of this idea when I started having babies. Honestly, it was all I could do to get one thing done, so that’s just what I did. If I wrote a thank you note one day, I would look for a stamp the next. And I didn’t worry that I couldn’t do more. 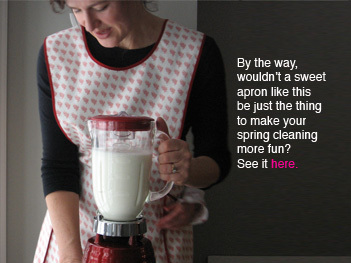 Nowadays, I’m not as time-stressed, but there is still always something more enticing than cleaning to distract me. So, I do my best to get things clean enough, and do One Extra. Try it, and see what you think. 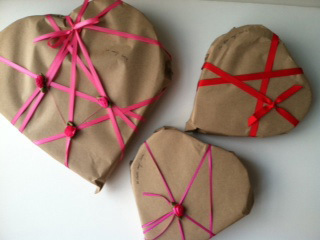 The beautiful heart shaped boxes that valentine candy comes in have always appealed to me. 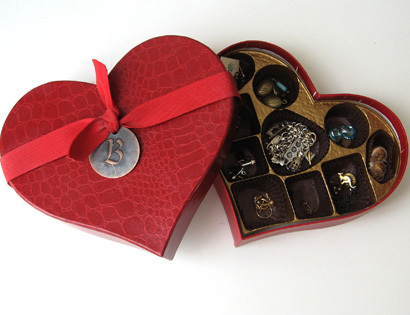 Years when I didn’t have a Valentine, I would have no qualms about searching for the perfect, small, heart shaped box of chocolates for myself. And over the years I have kept many of the empty boxes. They are simply too beautiful (and in some cases too sentimental) to throw away. 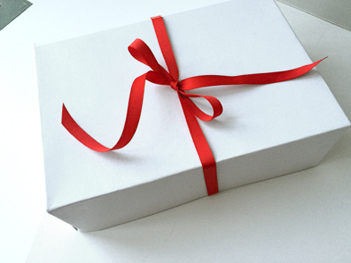 So here’s what I consider a perfectly delicious idea: Turn one or more of those pretty boxes into a jewelry box! If the inside is fitted with a plastic tray like the one shown, it provides perfect little compartments to house pairs of earrings. 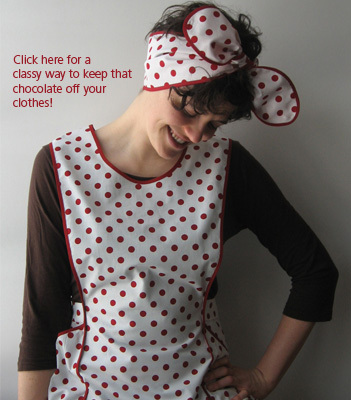 You can have just one, or stack two or three in graduating sizes. One for earrings, one for rings, etc. You get the idea. 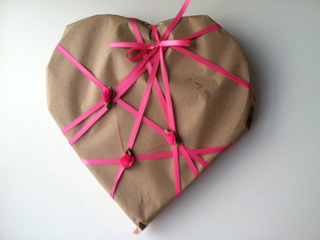 And if you don’t have a heart-shaped box that you’ve saved? What a great excuse to go out right now and buy one! Every once in a while it occurs to me that as much as I love a great holiday, I love the day after it’s over even better. Why is this? I think partly because the day after the holiday is over, I take back control. Am I a control freak? Maybe. But that’s beside the point. We all need to feel as if our lives, and in particular our happiness, is within our control. So, after the big winter holiday I might buy myself the gift I secretly hoped to get, (on sale of course), or snap up some 75%-off decorations. 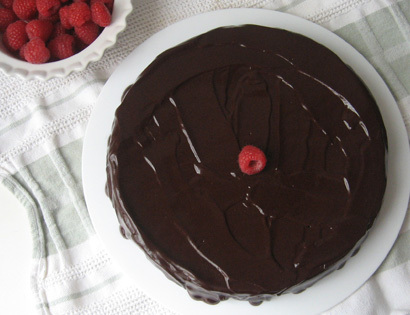 Well, here we are in February, So, the day after Valentines Day, why not make yourself this most decadent flour-less dark chocolate cake? Before you judge, keep in mind, dark chocolate is currently considered one of the super foods, due to its high antioxidant content. But possibly more important, eating chocolate triggers the release of endorphins making you love the whole world just a little more. 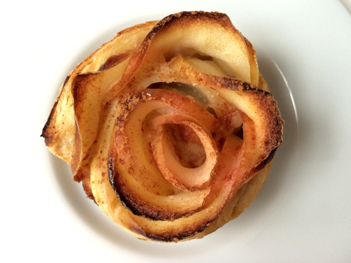 I found this recipe on line here. And making it will be just as pleasurable as eating it (the smell of dark chocolate infusing the house is worth it, right there). So let’s move on and take back the day. Preferably, with raspberries! I thought I was the first person to recognize that the flight attendant’s recommendation to strap the air hose onto yourself before helping your kids was an obvious analogy for how to approach motherhood. As the flight attendant points out (without actually saying it) you won’t be any good to your kids if you are passed out for lack of oxygen. Maybe I was the FIRST one to see it, but Laura Bennett beat me to the punch as her book (Didn’t I Feed You Yesterday–highly recommended, I might add) opens with that very idea. Never-the-less, it is obviously a good and valid idea. 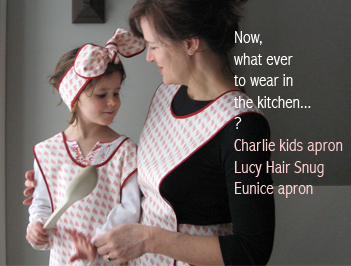 Being mom carries with it slights and sacrifices so numerous you lose count by lunch time. We know it. We do it every day. But since we knew the job was dangerous when we took it, we feel we have neither recourse, nor justification for complaint. So, this is that month when we all secretly hope to receive something that reinforces the fact that we are loved and cared about. And if you are one of the lucky ones, and get just exactly the flower, trinket or candy that you crave, in exactly the right setting, congratulations. You truly do deserve it. But if you are one of the many deserving that come up just a little disappointed, let me offer this thought: If it’s expected that on Valentine’s Day someone who loves you gives you flowers (or candy), than it should be required for you to give them to yourself. 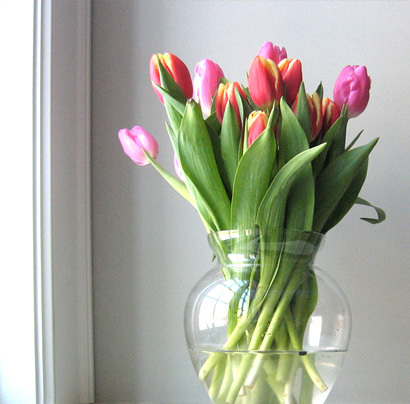 In fact, if you DON’T give yourself flowers on Valentine’s Day, you are just as guilty as every other loved one who doesn’t. 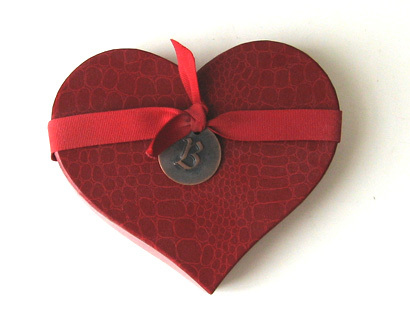 By the way, I’m aware that the Valentine tradition of giving things is secretly a marketing ploy started by the retailers of the world. So if you are of the mind to ignore it, I say more power to you, sister. On the other hand, it does make for a pretty good excuse to reward yourself, don’t you think? 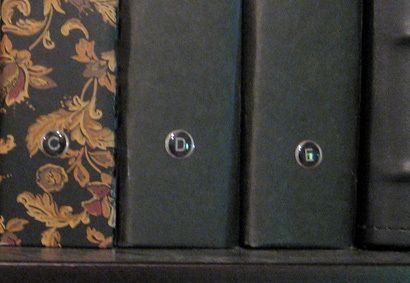 If you are looking for a photo album solution, it means you probably have boxes (or drawers, or computer files) of photos that have piled up. This tidbit is not exactly about organizing those. For now, I would either ignore them or if they have been printed, buy a whole bunch of matching photo boxes and at least get them all in one place. Once you have seen how clever you can be at photo org, you can go back and tackle them. This is about This Day Forward. Because if the very next time you take pictures you start doing this, the number of organized pictures will eventually surpass the number of disorganized ones. And hopefully you will inspire yourself to one day work on the others. (Besides, by then you’ll be a pro). Here’s the first key: In most of our lives there are really only a handful of photo events in any year. OK, if you have a newborn, there is a photo event every day. But generally, most of us haul the camera out a half a dozen times a year, usually centering on holidays or other significant ceremonies, etc. Even if you do snap away every day, use the big picture events to do this. As soon as possible after the next picture event, download your camera to your computer. Right now, before getting up, you are going to decide which ones to print. Just start going through them. If you like the picture, either name it or put it in a folder (whichever works for you). If you don’t like the photo, just skip to the next one. Don’t worry about throwing it out. (That’s the part that makes it way too hard). All you’re doing is identifying the ones you LIKE. Once you are sure the files are all in your computer, delete everything on the camera. 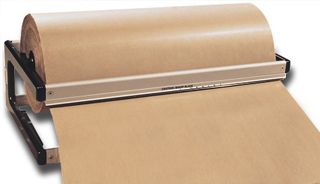 Now, go to a photofinishing website. I use my local drugstore. On the site you will learn to send your photos to the store (you’ve just identified which ones to print with your naming or file system) and they will make prints which you will go pick up. There will be options for paying online and/or having the prints sent to you. Do as you wish, but I find checking the box that says I will pay when I pick up is the easiest. This next part can be done at the same drugstore, or in my case I like the big box stores: Find some reasonably priced photo albums and buy as many as you are comfortable, like a row as wide as your shelf. Do the albums HAVE to be the same? No. Get what you want. 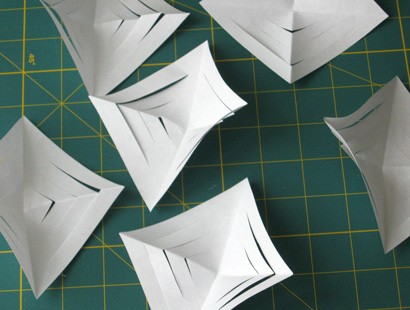 Sometimes sameness helps one to feel organized. And a whole row of identical albums is beautiful. My collection consists of chunks of like albums interspersed with the occasional fun surprise, partly because I like a little variety, and partly because of the way the collection has taken years to grow. Purchase a sheet of letters of the alphabet from the scrapbook aisle and letter the spines of the albums starting with A. Then, attach a “sticky note” inside the cover of album “A” and write the month and year of the photo event followed by a dash. Now put in all those photos you picked up. Repeat the process immediately after each picture event, with all shots that are in the camera, deleting the camera files when you have downloaded them to your computer. 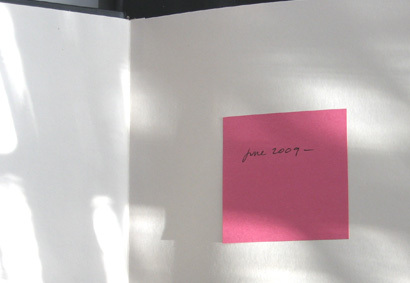 When the album is filled, write the current month and year on the sticky note (after the dash) and move on to album “B.” Once you’re sure the album is done, if you like, you can write the dates directly on the album page and scrap the sticky. I have used this system for years. 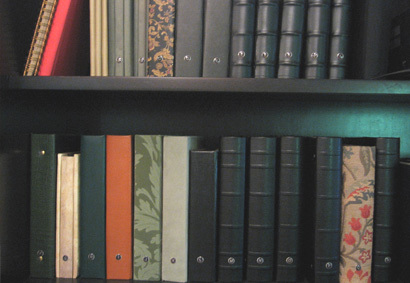 The resulting books are a constant source of joy for me and for anyone who comes in my kitchen (where the albums are stored, taking up more shelf space than the cookbooks). Of course I started the system long before there was digital photography. The main thing is to just start putting the pictures in books. And making it part of the photo-taking experience. You don’t have to feel bad if you don’t want to print them all, or put them all in the book. I’ve had occasions where I used most of an album on one single occasion. And others where there were only one or two photos that told the whole story. Since you don’t throw out the computer files, you will always have them as back-up. So you can proceed without feeling the burden of getting it exactly right. You rest assured knowing you can always go back in for “revisions” if you want to. Although we both know, you never will! In many places across the nation, this winter has been one of the most, well, wintery on record. Some of us are having weather we’ve never seen before. Here in Minnesota the snow came early and stayed. Well, in true BellaPamella fashion, the following suggestion (on the order of “if you can’t beat ’em, join ’em”) is to embrace the weather. Celebrate the flakes. Once we take down all the holiday stuff, the house takes on a certain simplicity, and I love that. For about a month. Then I start to wonder how long winter is going to linger. 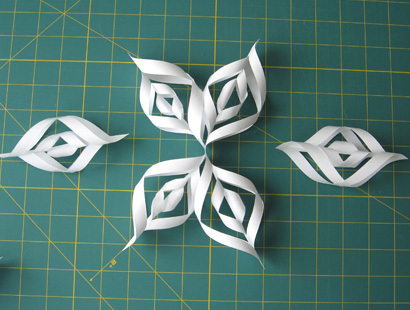 This year my daughter brought home a lovely snowflake project that she taught me how to do. We hung the flakes in the window in celebration (or was it defiance?) of a bright white yard that just refuses to melt. 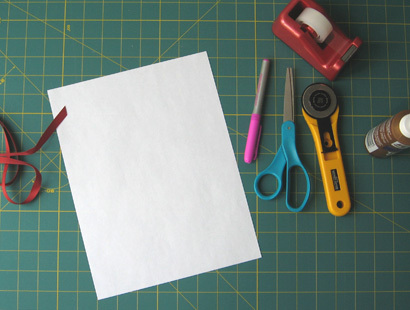 It’s one of my favorite kinds of projects because it requires only things we already have around: 8 1/2″ x 11″ white paper (printer paper is perfect), scissors or a rotary cutter and mat, tape and/or glue, and string or ribbon. 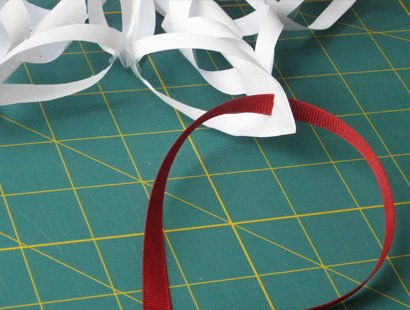 We have a supply of fabric ribbon and so we used red grosgrain. You will also need a pen with a smooth, even barrel on it to form the first loop. For this size snowflake, a pen that’s a little fatter than a pencil works well. 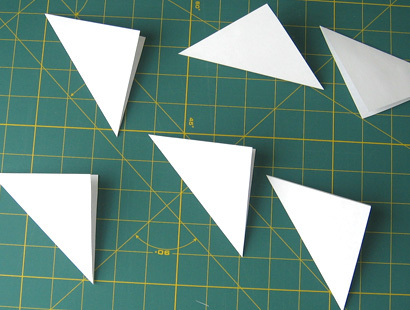 Start by cutting the paper into six 3 1/2 inch squares. 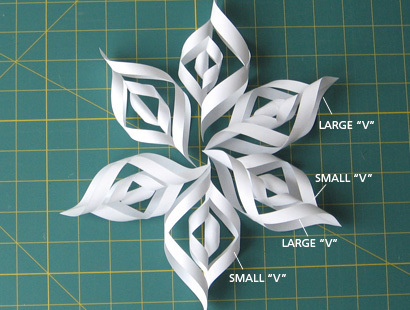 Each snowflake will take one sheet of paper. 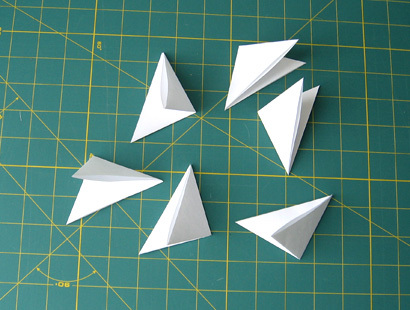 Fold each square in half diagonally, into a triangle. 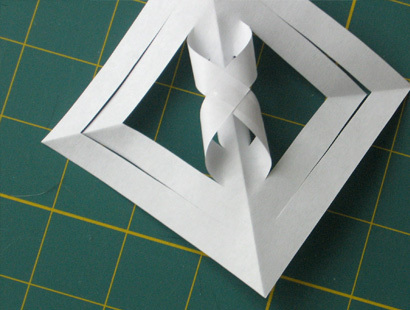 Then fold each in half again. 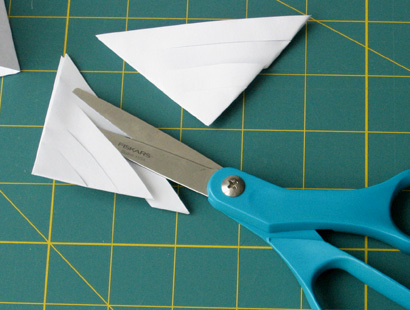 With scissors or the cutter, cut three slits on each triangle. 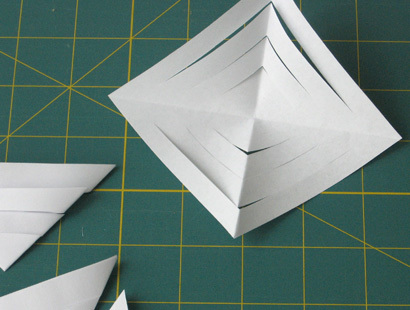 Cut parallel to the cut edges (not the folded ones) and cut to about 1/4 inch before you reach the fold. 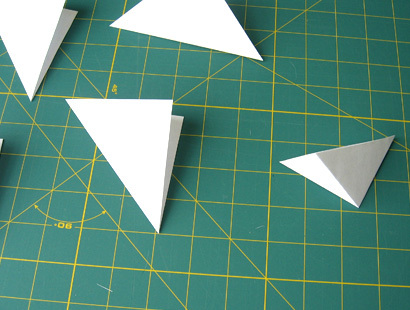 Carefully open the triangles back into squares. 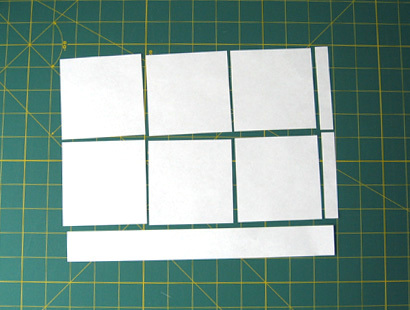 Each square should have six “V”s cut into it. 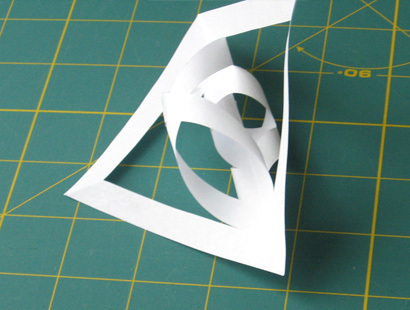 And gently smooth your finger along the middle crease to help flatten the paper. 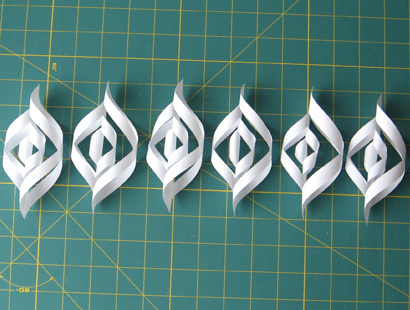 It’s best if you do the steps to each piece at the same time. 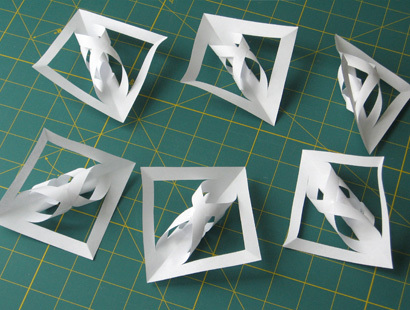 You will have six squares for each snowflake. 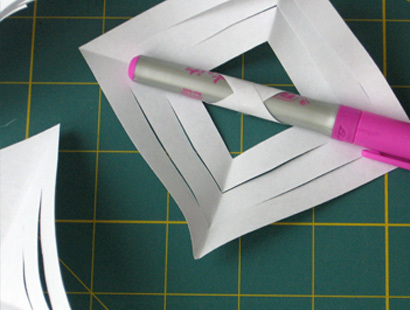 Now, wrap the two corners of the innermost square around the pen and secure it with tape. When you pull the pen out it looks like this. 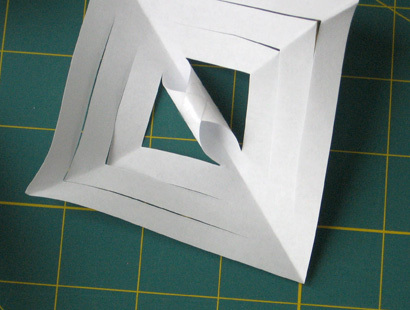 Turn the square over and loop the next two corners and secure with tape. This loop will be bigger than the first, AND FACING THE OPPOSITE DIRECTION AS THE FIRST. 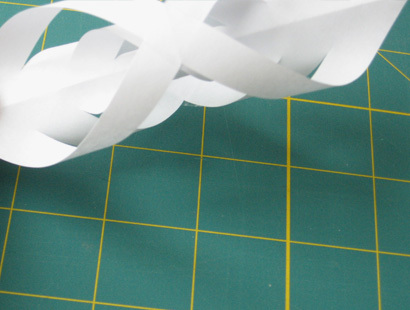 Turn over again, and tape the next corners the same direction you did the first loop. They now look like this. Now turn them over again and tape the last two (largest) corners. Notice how each piece has become a point of your flake. And also that each one has a large “V” on one side and a small “V” on the other side. Line up the six points with the large “V”s on the right. Now start to turn the points into a star. Make sure that each point is oriented the same way so that a large “V” is always next to a small “V”. We found the easiest way to attach the points together was to first tape two “pairs” together as shown. And then, tape on the last two points. You now have a full snowflake. 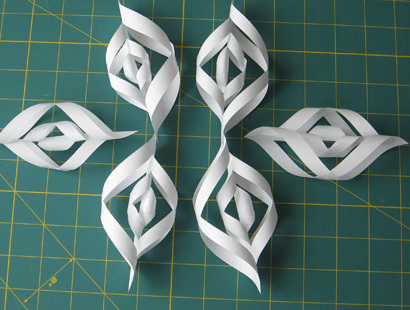 But you will probably find if you try to hang it, gaps will form between the points that are pointing up. Hold the snowflake by it’s top point and let it hang. 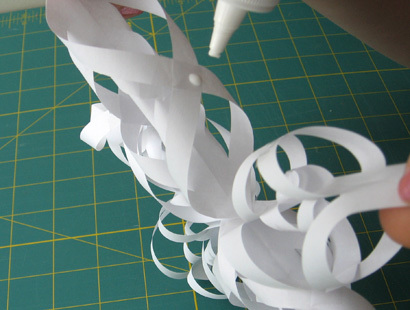 Where you see the gaps, put a dot of glue or a dab of glue stick, and pinch the spot together until it holds. 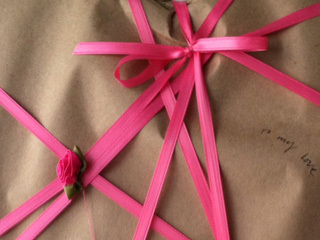 Finally, cut a small slit in the top point and lace your ribbon through. 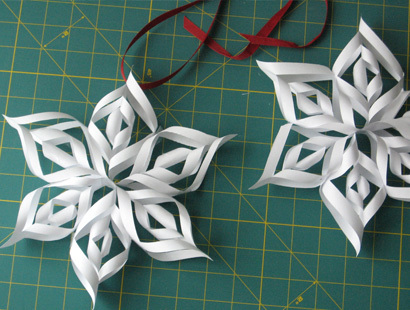 Make as many snowflakes as will brighten your room and stave off the winter blues! 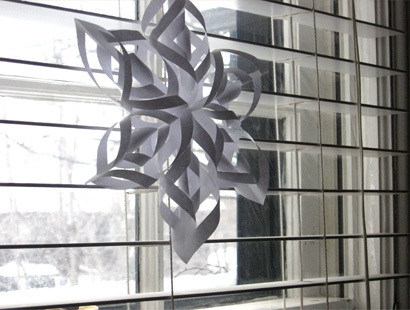 We have one snowflake hanging in each window. They make me smile every time I see them against that snowy yard. They serve as a reminder that there is beauty in all the seasons. You just have to look for it.